Make a God's Eye Christmas ornament with popsicle sticks, an easy project for kids! Make a God's Eye ornament out of popsicle sticks, an easy project for kids! We have made God's Eyes using twigs from the yard, popsicle sticks, toothpicks (using string instead of yarn). The larger one shown here was made from two plastic and wire "stalks" snipped off of some silk flowers. You can hold the sticks together with your hands while you start winding the yarn, but for small fingers, you might want to glue them together (in the shape of a cross) and leave to dry overnight before wrapping. Loop about 6 inches of yarn and hold against the back of the top stick. Wrap the yarn around both the top stick and the loop. This will become your loop to hang the God's Eye with. Bring the yarn down and wrap it around the left "arm". Wrap the yarn around the bottom "arm", then up and around the "arm". Wrap the yarn around the top stick and overlap the piece of yarn you have left dangling. Continue wrapping in this way, left, bottom, , top, until almost all the stick is covered. As a finishing touch, tie several strands of yarn or ribbon to the bottom stick. If you want to get really fancy, use different colored yarn. Try a b yellow for the center, then switch to a blue or green. Or use a rainbow of colors for a really pretty effect! We experimented making these with lots of different materials. Here's one we made for Christmas using popsicle sticks, wrapped with red, green and white chenille. 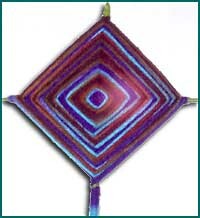 The Huichol Indians of Mexico and the Aymara Indians of Bolivia weave bly colored yarn on a simple frame of crossed sticks to make a design called "Ojo de Dios" or "Eye of God". Originally, "God's Eyes" were made to be placed on an altar so that the gods could watch over the praying people and protect them. They are now more often sold in markets, reminding us that God looks with love on people everywhere. Thanks to The Kid's Corner for this tidbit.